Penelope Daborn finds that WILLEM SMITH’s customer service is just as thought-through as its design and function. For Penelope Daborn, great customer service isn’t simply a by-product of the creative energy she invests in delivering excellent interior design; it’s built into the ethos of her Falmouth, Maine company. Penelope Daborn Ltd. recognizes that courteous and efficient project management requires its own effort, thought and vigilance. 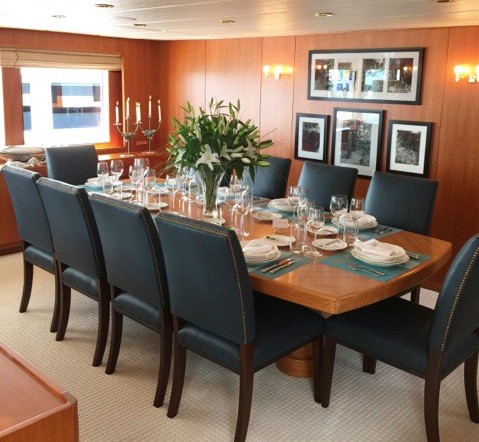 WILLEM SMITH’s attentive, proactive and client-first customer service is what Penelope and her associate Denise Dillow experienced for their recent project refurbishing the interior of a client’s yacht. 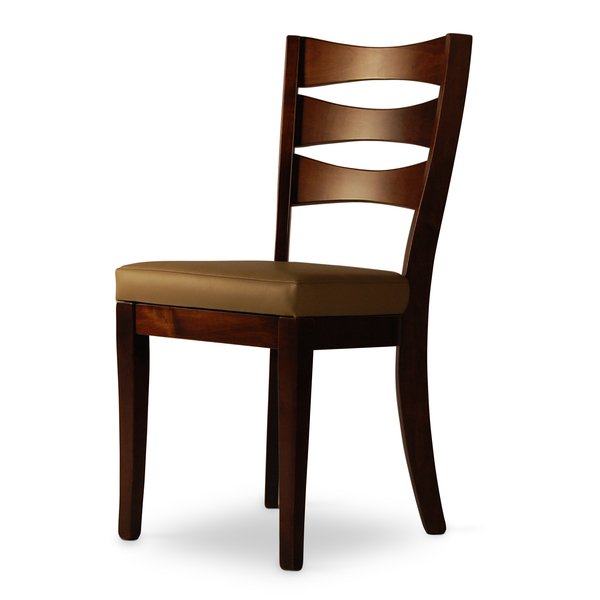 “We selected the Brisa Three-Hour Dinner Party Chair because the chairs are handsome, ideally-scaled and the leather is beautiful. But what struck us was how John and JB bent over backwards to ensure that the chairs would arrive exactly as ordered and on time even as the already tight schedule was further shortened. We hated to ask for the near impossible but circumstances were such that we had to. The frenzy resulted in a very happy and grateful client with a beautiful dining room." Then the ship sailed. Go to penelopedaborn.com to read more about Penelope Daborn Ltd.
People tend to think about dining chair comfort the way men approach haircuts. Basically men just want to blend in. Indeed among men (the demographic with which I am familiar), typically a good, or even average, haircut doesn’t spark commentary. Truth is, we simply don’t notice. On the other hand, a bad haircut doesn’t get gossiped about because we prefer the full frontal attack, such as “Dude, you and the weed-wacker have a disagreement last night?” Similarly, it would be highly unusual that driving home after dinner at the Joneses you would announce “The haricots verts were clearly canned but my chair was divinely comfortable”. 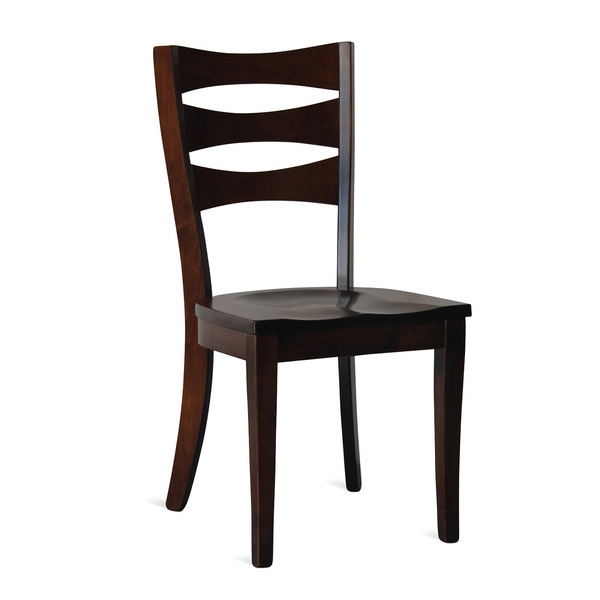 We think that the Amish community builds the best solid wood chairs. Since we don't like to settle for second best, we have our friends in Ohio build this marvel of compact comfort. Ergonomics [ər-gə-ˈnä-miks\] Eng, n. The relationship between human anatomy and specific activities and usually refers to items designed to maximize the efficiency between workers and their environment. For example, desk chairs are adjustable to reduce back and neck strain and keyboard palm-rests are modified to avoid carpal tunnel issues. While historically this concept has not been used in the residential furniture vernacular, ergonomics, comfort and practicality are significantly interdependent (see piErgonom). piErgonom [pī ’ur-goh-nahm] Comfort that has been agonized over. A thought-through comfort metric universalized by furnituremakers WILLEM SMITH in the early 21st century. Examples of piErgonom furniture include seating that provides surprising (and necessary) lumbar support, tables where legs never get in the way and chairs whose comfort encourages three hour sessions at the dining table.